"There were 32 strikes with 1,776 munitions delivered" against IS targets between October 17 and 23, coalition spokesman Colonel John Dorrian told AFP. He said those strikes had destroyed 136 IS fighting positions, 18 tunnels and 26 car bombs. Iraqi forces advancing on Mosul today faced stiff resistance from the Islamic State jihadist group despite an unprecedented wave of air strikes by the US-led coalition in support of the week-old offensive. Federal forces and Kurdish peshmerga fighters gained ground in several areas, AFP correspondents on various fronts said, but the jihadists were hitting back with shelling, sniper fire, suicide car bombs and booby traps. IS has also attempted to draw attention away from losses around Mosul with attacks on Iraqi forces elsewhere in the country, the latest coming yesterday near the Jordanian border. Following a weekend visit to Iraq by US Defence Secretary Ashton Carter, American officials said the coalition was providing the most air support yet to the operation. "One week into Mosul operation, all objectives met thus far, and more coalition air strikes than any other 7-day period of war against ISIL (IS)," Brett McGurk, the top US envoy to the 60-nation coalition, wrote on social media. The offensive, launched on October 17, aims to retake towns and villages surrounding Mosul before elite troops breach the city and engage die-hard jihadists in street-to-street fighting. On the eastern side of Mosul, federal troops were today battling IS in Qaraqosh, which used to be the largest Christian town in the country. Army forces entered the town for the third day running but armoured convoys deployed around it were met with shelling from inside, an AFP correspondent reported. Federal forces also scored gains on the southern front, where they have been making quick progress, taking one village after another as they work their way up the Tigris Valley. On the northern front, Kurdish peshmerga forces were closing in on the IS-held town of Bashiqa. Turkey, which has a base in the area, said yesterday it had provided artillery support following a request from the peshmerga. The presence of Turkish troops on Iraqi soil is deeply unpopular in Baghdad and the Joint Operations Command today vehemently denied any Turkish participation. But AFP reporters near Bashiqa said artillery fire coming from the Turkish base had been sighted on several occasions since the start of operations a week ago. While an increasingly pragmatic IS has tended in recent months to relinquish some of its positions to avoid taking too many casualties, US officials said the group was mounting a spirited defence of Mosul. AL UDEID AIR BASE, Qatar -- Coalition airpower continues to complement Iraqi Security Forces in the offensive to recapture Mosul, Iraq, contributing to the ultimate destruction of Da’esh’s hold on the country’s second largest city. The Air Coalition has conducted approximately 100 airstrikes since the operation initially began on Oct. 17. The Air Coalition has been targeting Da’esh in Mosul throughout the campaign. While the Government of Iraq has the lead for operations in Mosul, the Air Coalition stands ready to provide precision airpower for the indigenous ground forces when requested. The U.S. Air Force is providing the full spectrum of air assets from intelligence, surveillance and reconnaissance assets to refueling assets to strike assets to both air and ground-based command and control to support the Iraqis. The strikes are conducted as part of Operation Inherent Resolve, the operation to eliminate Da’esh and the threat they pose to Iraq, Syria and the wider international community. PARIS: French warplanes have tripled their rate of airstrikes to support Iraqi forces since the start of the offensive to retake Mosul from ISIS militants, the military said Thursday. France carried out 63 airstrikes on targets around Mosul between Oct. 17 – when the operation to take back Iraq's second-largest city began – and Nov. 1, a spokesman said. In all, French jets launched 75 strikes in both Iraq and on ISIS targets in Syria during the same period. The spokesman, Colonel Patrik Steiger, said the strikes had decreased in the last few days as the ground offensive had "slowed" after an "initial phase of rapid progression." French jets, operating as part of the international coalition against ISIS, fly from bases in Jordan and the United Arab Emirates and the Charles de Gaulle aircraft carrier in the Mediterranean. غارة على الموصل كل ثمان دقائق، هذا ما تعيشه المدينة منذ اعلان عمليات تحرير المدينة من تنظيم داعش قبل اسابيع. فمع بدء العمليات العسكرية بدات طائرات التحالف قصفا مكثفا على المدينة ومحيطها، في محاولة لتسهيل تقدم القوات العراقية باتجاه مركز الموصل. صحيفة الواشنطن تايمز الأمريكية كشفت عن قيام سلاح الجو الأمريكي بتنفيذ عشر غارات كل ساعة على الموصل، وذلك في إطار المعركة المعلنة لاستعادتها من قبضة تنظيم داعش. ووفقاً للكولونيل دانيال مانينغ، نائب مدير مركز العمليات الجوية المشتركة، تقول الصحيفة: إنه منذ أن أعلنت معركة الموصل فجر السابع عشر من شهر أكتوبر تشرين الأول الماضي، تعرضت الموصل لعاصفة رعدية من القنابل التي ألقاها سلاح الجو الأمريكي، بمعدل غارة كل 8 دقائق، خاصة في الأيام الثلاثة الأولى من انطلاقها . وتنقل الصحيفة عن ضابط في الجيش الأمريكي قوله: إن القاصفة بي 52 أسهمت مساهمة فعالة في حملة القصف على الموصل”، مشيراً إلى أن “الحلفاء العراقيين يريدون رؤية القاصفة الأمريكية وسلاح الجو الأمريكي وهو يقديم الدعم والإسناد لهم . من جهة اخرى , أشارت الصحيفة إلى أن التقارير الواردة من الموصل تؤكد أن التنظيم قام بحفر شبكة واسعة من الأنفاق التي بات يستخدمها ككمائن لاصطياد القوات المهاجمة، وهو ما أشارت إليه الأنباء الواردة من هناك وبالتالي فان المدنيين هم الخاسر الاكبر من القصف المكثف على المدينة. وبحسب مصادر محلية فان الاحياء الشرقية من مدينة الموصل تعرضت لقصف من قبل طيران التحالف خلال الايام الخمسة الاخيرة، واكدت المصادر ان عشرات المدنيين قتلوا واصيبوا جراء ذلك القصف. شنت قوات التحالف الدولي بقيادة الولايات المتحدة 18 غارة على مواقع عصابات داعش الارهبية في العراق وسوريا خلال الساعات الـ 24 الأخيرة. وقالت القيادة المركزية لعمليات قوات التحالف في بيان اليوم الأربعاء، ان "الغارات استهدفت مواقع داعش بالعراق قرب الموصل وراوة وتلعفر". وفي سوريا "استهدفت طائرات التحالف مواقع داعش قرب مدن عين عيسى ومارع والرقة والبو كمال". A coalition of 67 countries are engaged in international efforts to counter ISIS (also known as Daesh, ISIL or so-called Islamic State). The military campaign in Iraq and Syria is just one aspect of that broader strategy which also includes measures to restrict the flow of foreign fighters, stop foreign financing, provide humanitarian assistance to Iraq and Syria and strategic communications (propaganda, public diplomacy and psychological operations) intended to counter ISIS’ ideology. It is the military campaign against ISIS which is the focus of this paper. It does not examine the ongoing civil war in Syria or the role of third parties in that conflict. The United States has led airstrikes against ISIS in Iraq since 8 August 2014. Operations were extended into Syria toward the end of September 2014. With a view to building the capacity of local forces on the ground, offensive military action in Iraq and Syria has focused largely on air operations in support of those local forces, providing intelligence, reconnaissance, surveillance and attack capabilities. The other element of the campaign is the training of Iraqi and Kurdish security forces as a means of enabling them to take responsibility for operations against ISIS on the ground. Targeted Special Forces operations are providing advisory assistance to Iraqi and local forces on the ground. A US-led programme of support is also being provided to opposition forces in Syria. Military action in Iraq is being conducted at the request of the Iraqi government, which coalition partners consider provides a firm legal basis for operations. Military operations in Syria are not at the request of the Assad government, and are being conducted in the absence of a UN Security Council resolution specifically authorising such action. However, coalition nations have expressed the view that such operations are legally justified on the basis of the collective self-defence of Iraq, and the individual self-defence of participating nations. In recent months, the dynamics of the campaign have begun to shift as ISIS has increasingly lost territory, operations to re-take Mosul (the last urban stronghold of ISIS in Iraq) have begun, and regional players such as Turkey have made moves to secure their spheres of influence. The lines between the campaign to defeat ISIS and the Syrian civil conflict are also becoming increasingly blurred with Russia’s support for the Assad regime complicating the strategic picture in Syria. As of 25 October 2016, Coalition aircraft have conducted a total of 15,861 airstrikes (Emphasis added—Ed.) against ISIS targets in Iraq and Syria (Iraq – 10,245 and Syria – 5,616). Approximately 68% of airstrikes in Iraq and 95% of airstrikes in Syria have been conducted by US aircraft. The Pentagon estimates that ISIS has lost 50% of the territory it once controlled in Iraq and now occupies less than 10% of Iraqi territory in total. After months of preparation the operation to liberate Mosul began on 17 October 2016. A coalition of 35,000 Iraqi security forces, Kurdish Peshmerga, Sunni Arab tribesmen and Shia paramilitary forces are participating in the operation, supported by Coalition intelligence and surveillance, airstrikes, and 100 US Special Operations personnel advising on the ground. Turkey has been pushing for a role in the campaign, a proposal which the Iraqi Prime Minister, Haider al-Abadi, has firmly rejected. The operation is expected to take several weeks, if not months. In response to concerns over the involvement of Shia militiamen in the campaign, the Iraqi Prime Minister has stated the need for a multi-sectarian approach, but confirmed that only Iraqi security forces will be allowed to enter Mosul when the campaign reaches that point. The Pentagon has estimated that ISIS has lost approximately 20% of the territory it once held in Syria. Over the summer operations by Syrian Democratic Forces (SDF), an alliance of opposition and local forces including the Syrian Arab Coalition and Kurdish forces in Syria, focused on liberating the town of Manbij, on Syria’s northern border with Turkey. Assisted by Coalition forces Manbij was liberated in mid-August 2016 after two months of fighting. Efforts to secure the region along Turkey’s border have advanced significantly over the last few months after an offensive led by an alliance of Syrian rebel groups, and supported by Turkey, was launched in late August (Operation Euphrates Shield). Key towns have been liberated from ISIS including al-Rai and Jarabulus. Turkish involvement in the campaign to take Jarabulus represented Turkey’s first full-scale incursion into Syria since the civil conflict began. While striking a blow against ISIS, Turkey’s actions have also been motivated by a desire to secure its regional sphere of influence and stop the Kurds from advancing into areas in north eastern Syria, thereby unifying the eastern and western areas that they currently hold along the Turkish border. With the Mosul offensive now underway attention has increasingly turned to the campaign to liberate Raqqa. On 6 November 2016, the SDF announced that the campaign to “isolate”, and eventually liberate, Raqqa had begun. The SDF will be supported by coalition airstrikes. Russia is not currently involved in the plans to liberate Raqqa. Who is in the military coalition? أعلن التحالف الدولي الذي تقوده الولايات المتحدة ضد "داعش" في العراق، الثلاثاء، أن طائرات التحالف قصفت مواقع لعناصر "داعش" بأكثر من أربعة آلاف قنبلة منذ إنطلاق عمليات تحرير نينوى، مبينا انها أسفرت عن مقتل المئات من "الإرهابيين" وتدمير 59 عجلةٍ مفخخةٍ و80 نفقاَ. وقال المتحدث باسم التحالف العقيد جون دوريان خلال مؤتمر صحفي مشترك لقيادة العمليات المشتركة عقد في ناحية القيارة جنوب الموصل، وحضرته السومرية نيوز، "أحيي طريقة القتال الباسلة للقوات العراقية المحررة التي كانت ولا تزال حريصة جداً على حماية المدنيين". وأضاف دوريان، أن "التحالف الدولي يشيد بإنجازات تلك القوات البطلة التي تحرر وتمسك الأرض بالرغم من المحاولات العديدة لعناصر داعش بإستعادة تلك المناطق، والتي تنتهي بالفشل"، مهنئاً إياهم بـ "تحرير ناحية النمرود الأثرية". وبخصوص دور التحالف الدولي في العمليات، أوضح دوريان "اننا نواصل ضرب داعش بالقنابل الجوية"، لافتا الى انه "تم قصف مواقعهم بأكثر من أربعة آلاف قنبلة منذ إنطلاق عمليات تحرير نينوى، حيث أسفرت عن مقتل المئات من الإرهابيين وتدمير 59 عجلةٍ مفخخةٍ و80 نفقا". أعلن مجلس محافظة نينوى، الخميس، أن طائرات التحالف الدولي دمرت الجسر الحديدي العتيق في مدينة الموصل، مشيراً الى عزل الساحل الايمن عن الايسر بالكامل. مدينة الموصل بضربه، اليوم، الجسر الجديدي العتيق وسط المدينة"، مشيرا الى أن "التحالف كان قد دمر خلال الايام الماضية الجسور الخمسة التي تربط الساحلين". واوضح البياتي أن "طيران التحالف فصل بهذه الضربة محافظة نينوى الى جزئين وحصر تنظيم داعش في مواقعه"، مشيرا الى أن "التنظيم سيقبر في ارض نينوى". ضربات القوات العسكرية، ولن يستطيع ان يتحرك بعد اتمام عملية محاصرته من جميع الجبهات". مراقبون فأن الضربات دقيقة جداً وستمكن الجهد الهندسي من إعادة الجسور الى العمل بسرعة بعد تحرير المدينة . تنظيم "داعش" مؤخراً إلى تلغيمها كلها لغرض اعاقة تقدم القوات الامنية العراقية. شنت طائرات التحالف الدولي بقيادة الولايات المتحدة الاثنين 28 نوفمبر/تشرين الثاني 21 غارة على مواقع تابعة لتنظيم "داعش" الإرهابي في العراق وسوريا خلال الـ24 ساعة الأخيرة. وقالت القيادة المركزية لعمليات قوات التحالف في بيان: "طائرات التحالف نفذت 9 غارات على مواقع داعش في مدن بشير وبيجي والموصل وراوة وتلعفر في العراق". وأضافت القيادة أن الطائرات "نفذت 12 غارة على مواقع داعش في سوريا قرب البو كمال والرقة وعين عيسى ودير الزور والشدادي". 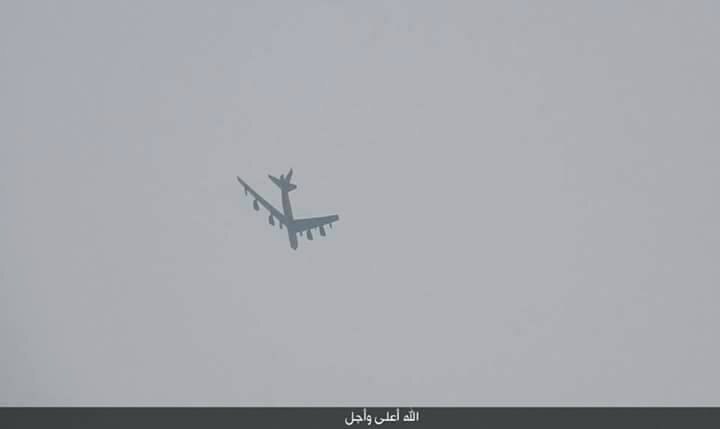 أفاد مصدر أمني في محافظة صلاح الدين، الثلاثاء، بأن القاذفة الأميركية العملاقة "B51" دمرت واحدا من أكبر مستودعات السلاح والعتاد التابعة لتنظيم "داعش" في الشرقاط شمال المحافظة. وقال المصدر في حديث لـ السومرية نيوز، إن "القاذفة الأميركية العملاقة (B51) شاركت في ضربات جوية محدودة في قرية الكنعوص في الساحل الايسر من قضاء الشرقاط (45 كم شمال تكريت)، حيث استهدف القصف واحدا من أكبر مستودعات تخزين السلاح والعتاد لداعش"، مبينا أن "القاذفة تعد من أكثر الطائرات دقة في ضرباتها ضد التنظيم". وأضاف المصدر الذي طلب عدم الكشف عن اسمه، أن "المستودع قصف بالتنسيق مع الاجهزة الاستخبارية العراقية". F-16، من العمليات العسكرية في سورية والعراق. وذكرت المحطة التلفزيونية أن وزيري الخارجية أندرس سامويلسن، الذي تسلم منصبه في الآونة الأخيرة، والدفاع كلاوس هيورت فريدريكسن اتخذا قرار سحب المقاتلات. وتأتي الخطوة بعد أن خلص تحقيق عسكري أميركي هذا الأسبوع إلى أن طائرات حربية دنماركية شاركت في ضربة عسكرية للتحالف بقيادة الولايات المتحدة في 17 سبتمبر/ أيلول ارتكبت خلالها "أخطاء بشرية غير مقصودة"، وأسفرت عن مقتل مسلحين موالين للحكومة السورية بدلا من متشددي تنظيم الدولة الإسلامية داعش. وتشارك الدنمارك، وهي عضو في حلف شمال الأطلسي (ناتو)، في التحالف الدولي الذي تقوده الولايات المتحدة ضد داعش.